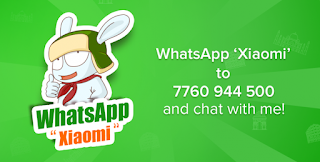 Xiaomi has launched its WhatsApp service in India that allow them to get receive Xiaomi news, new product launches, exciting product deals, sale reminders, notifications about MIUI weekly updates, and reminders about Mi Fan meetups. You can also unsubscribe from this WhatsApp service anytime by texting STOP, says Xiaomi. It says that the service is currently being Beta tested and is limited to the functionalities mentioned above Xiaomi also says that your name, contact number, and location will not be accessible to third-party services.